The challenge set at the end of PBS 18 was to create prototypes representing IP addresses and subnets, and to test them by using playground inputs 1 and 2 to create a subnet object, and testing if an IP address from playground input 3 is contained within that subnet or not. As always, I want to stress that there are an infinity of possible correct solutions, so this is just my solution. Your code can be different from mine, and yet still totally correct. I want to draw your attention to some key points in this solution. Firstly, like in previous examples and solutions, the code in the object prototypes remains defensive – arguments are not assumed to be correct, but are checked. What has changed from previous examples is how the functions within the prototype respond to invalid data – instead of printing a message or returning a special value, they throw an error. By writing the prototypes in such a way that they throw errors, the code for using the prototypes can be simplified. All code that could trigger errors is wrapped in a single try block, and all possible errors are dealt with within a single catch block. Secondly, a lot of the data validation is done through regular expressions. Most browsers allow you to have the console appear as a sidebar (or bottom bar) within a tab, or, as a detached floating window. I prefer floating windows, but to each their own! The exact mechanisms for accessing and using these consoles vary from browser to browser, as indeed do the names the browsers use to describe them. My absolute favourite remains that in Safari, so I do all my development work in that browser, but to remain cross-platform, we’ll use the FireFox console here. 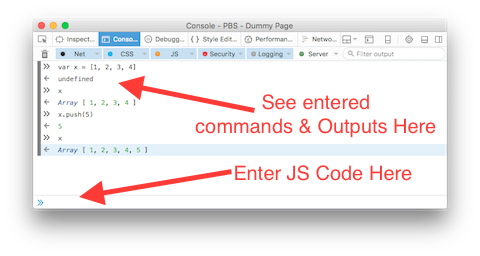 To test the console, lets open a dummy page in FireFox, and then activate FireFox’s console on that page. You can access the dummy page on my server, or you can download the code and run it in your own local server. 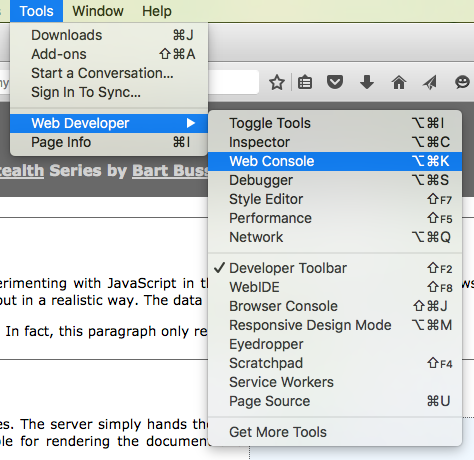 Once you have the page open, go to the Tools menu, then to Web Developer, and click on Web Console. By default, this should open the console in a docked region at the bottom of the browser window. 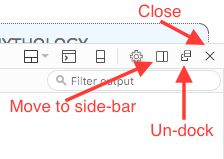 The buttons at the top-right of this region allow you to close the console, un-dock it so it becomes a floating window, or, change it to a side bar. I like to un-dock it, so that’s how you’ll see it in my screenshots. The bar at the top of the console region lets you control what messages you see. Messages from different origins will have different colours. You can control the messages from each origin that you see with the colour-coded drop-down menus starting at the left of the bar. At the far left of the bar is a trashcan icon which will empty the console, removing all messages. The right of the bar contains a search box that you can use to do real-time filtering of the messages show in the console. The entire jQuery API is presented out through a single object called jQuery. By default, a reference to the jQuery object is also saved to a variable in the global scope simply named $. This is a legal variable name that’s both short and easy to type, and distinctive enough to stand out. Almost all jQuery code you see on the net uses the variable $ rather than the variable jQuery to interact with the jQuery library, and that’s what we’ll do in this series too. When working with jQuery, you generally start by asking jQuery to query the DOM for one or more elements on the page, and then you either interrogate those elements, or alter them in some way. The $ object can be called as a function, and when passed a CSS-style selector as the first argument, it will return a jQuery object representing all matching elements in the page. Query objects are array-like structures, and most consoles show them as arrays of HTML code. jQuery objects contain a large number of functions, and when invoked, these functions will operate on all the HTML elements the object represents. Philosophically, jQuery likes to keep function names short, and, it likes to use the same function to query and alter a value, or to add and execute an event hander. What you’ll see is that when querying against multiple elements (there are many links on the page), the value you get back is the value from the first element in the set. In general, you would use a more specific selector to target exactly the a tag who’s href you wanted to query. If you click on any link now, it will take you to Allison’s website! 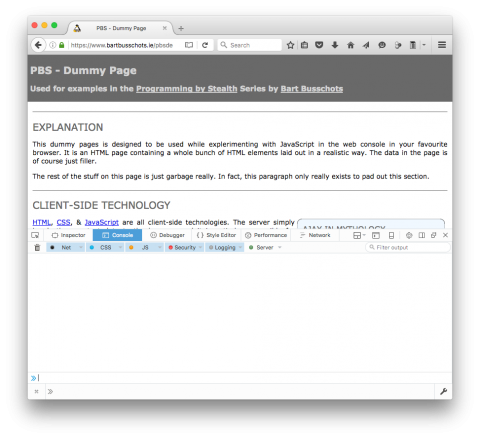 To get the dummy page back to normal, simply refresh the page in your browser. Cool – thanks for the correction Calum.